In the Cathedral of Cremona we face with the most incredible representation of the Last Supper, even more stronger than the famous fresco by Leonardo da Vinci in Milan. 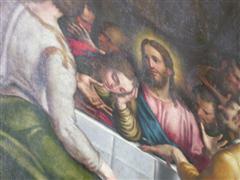 It was painted in the sixteenth century by Giulio Campi. At the first sight we can see a framework in which John is certainly a woman; we need only to observe these images to remove any doubt. The face is quite feminine, the features are sweet and a she is also a particularly pretty woman. So far, there is no doubt. Here we face with something more. The Last Supper is inside the Chapel of Mary Magdalene. Here are represented all the most important moments of the life of Mary Magdalene, including the Last Supper! As a comic strip, the woman is always the same! In all these paintings there is only one protagonist, Mary Magdalene. It is her in the washing of the feet, as well as in the noli me tangere and the last supper! She has the same features and the same clothes. This is clear for all to see. PreviousWas Mary Magdalene ever a prostitute?